30 18" 32" 47" 2"
Separates solids before the pump. Tired of cleaning out your pump strainer basket? Want a sediment tank but you don't have the space? Wish you could lower the time you spend back washing your filter? THE FLUID ART TURBOVORTEX IS THE ANSWER. What is the best thing you can do for your filter? Keep solids out of it so it can do what it really is supposed to do and that is handle solubles and not solids. 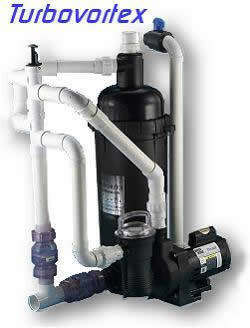 This is truly the answer to the problem of removing solids so you can have a more efficient filter. The Fluidart Turbovortex fits between the pond and your pump catching solids and waiting to be back washed which is as simple as moving a valve and the solids are gone to waste, a simple 1 minute operation about once a week. [Note: Pump purchased separately].